Lornoxicam is a new non steroidal anti-inflammatory medication of the oxicam class with analgesic and antipyretic properties. Lornoxicam Paracetamol was also as effective as other NSAIDs in relieving symptoms of osteoarthritis, rheumatoid arthritis, ankylosing spondylitis etc. Linezolid is in a class of antibacterials called oxazolidinones, prescribed to relieve inflammation, swelling and stiffness. It is of particular use for arthritic conditions, muscle injury and broad spectrum pain relief which is available in oral and parenteral formulations. Non-steroidal, Anti-Inflammatory and Pain reliever. Use of Lornoxicam may result in a number of mild to severe side effects based on the dosage and the particular individual. Lornoxicam side effects are cause for concern if they worsen or occur regularly. 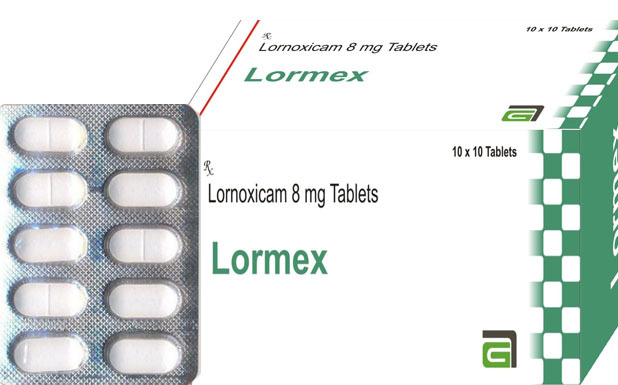 The most common Lornoxicam side effects reported with the regular use of the tablet form of Lornoxicam include dizziness, headache, stomach pain, upset stomach, diarrhea, nausea, vomiting and indigestion. Lornoxicam mode of action is partly based on inhibition of the prostaglandin synthesis. Lornoxicam is an NSAID that is used in musculoskeletal, joint disorders and other painful conditions including postoperative pain. Lornoxicam mode of action is also based on absorbing rapidly and almost completely Maximum plasma concentrations from the gastro-intestinal tract approximately in 1 to 2 hours. The active drug in Xefon is Lornoxicam, a non-steroidal anti-inflammatory drug with analgesic properties that belongs to the class of oxicams. Lornoxicam drug is almost completely absorbed from the gastrointestinal tract. After administration of Lornoxicam drug, all volunteers reported a significant decrease in pain intensity with a time-to-peak effect of approximately 20 - 30 min and an elimination half-time of 3 - 5 hr in healthy young volunteers. Lornoxicam drug is well-known efficacy in relieving post operative pain in humans prompted us to evaluate its effect on cerebral pain processing. Lornoxicam tablets (Lorcam), an oxicam-derived non-steroidal anti-inflammatory drug (NSAID) used for the relief of pain. Lornoxicam tablets are for short-term treatment of moderate postoperative pain, such as pain after dental surgery, pain associated with acute lumbo-sciatia and inflammation in osteoarthritis and rheumatoid. Lornoxicam Tablets & Capsule formulations are also available in different drug delivery forms like 4mg, 8mg etc. We also have large volume manufacturing facilities for these Products.